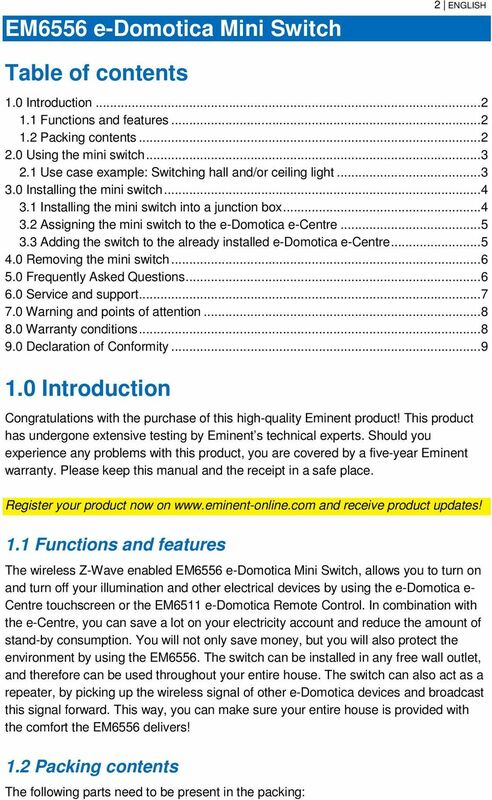 Download "EM6556 e-domotica Mini Switch"
3 EM6556 e-domotica Mini Switch Manual 3 ENGLISH 2.0 Using the mini switch In the following figure you can see one of the most common situations to use an EM6556 Mini Switch in combination with the EM6514 Wall Switch Sensor. By using the EM6514 Wall Switch Sensor (sold separately, not included) you are able to use your existing wall switch to activate a scene at your own desire. 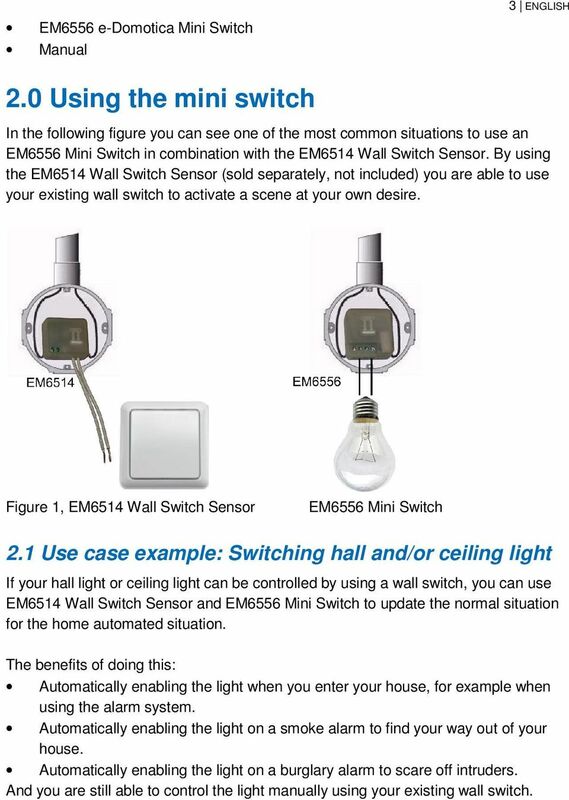 Figure 1, EM6514 Wall Switch Sensor EM6556 Mini Switch 2.1 Use case example: Switching hall and/or ceiling light If your hall light or ceiling light can be controlled by using a wall switch, you can use EM6514 Wall Switch Sensor and EM6556 Mini Switch to update the normal situation for the home automated situation. The benefits of doing this: Automatically enabling the light when you enter your house, for example when using the alarm system. Automatically enabling the light on a smoke alarm to find your way out of your house. Automatically enabling the light on a burglary alarm to scare off intruders. And you are still able to control the light manually using your existing wall switch. 4 4 ENGLISH 3.0 Installing the mini switch 3.1 Installing the mini switch into a junction box Warning! If you do not have enough electrical skills, do not continue and let a certified electrician do the job for you. Otherwise you might get injured and/or electrocuted. If you do have the skills, be very careful. Take notice of the following Disable the mains of your house by turning of the main switch, before you continue. Otherwise you might get injured and/or electrocuted. In some older houses the colors of the wiring can be different. In some situations not all wires are available and you might need to pull an extra wire from the nearest distribution box. Do not install the mini switch near combustible substances or any source of heat, e.g. fires, radiators, boilers etc. 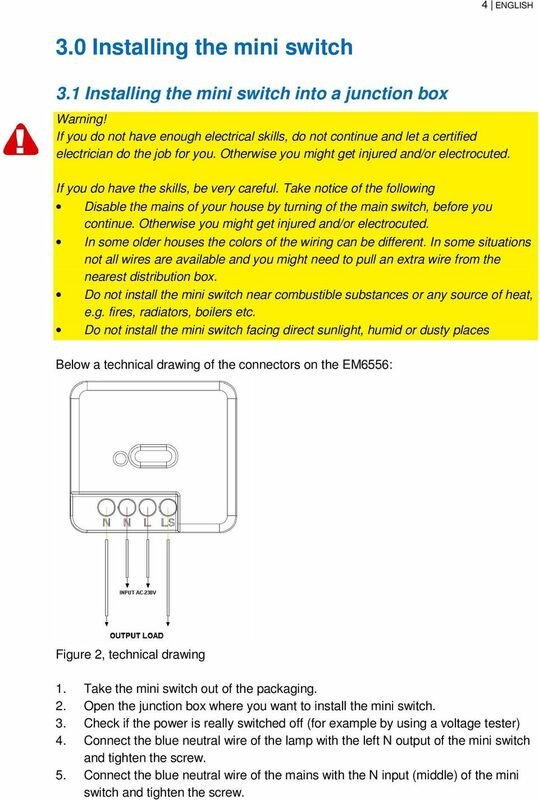 Do not install the mini switch facing direct sunlight, humid or dusty places Below a technical drawing of the connectors on the EM6556: Figure 2, technical drawing 1. Take the mini switch out of the packaging. 2. Open the junction box where you want to install the mini switch. 3. Check if the power is really switched off (for example by using a voltage tester) 4. Connect the blue neutral wire of the lamp with the left N output of the mini switch and tighten the screw. 5. Connect the blue neutral wire of the mains with the N input (middle) of the mini switch and tighten the screw. 5 5 ENGLISH 6. Connect the switching wire of the lamp with the LS input of the mini switch. Often this wire has a black color. 7. Connect the 230v live wire of the mains with the L input of the mini switch. Often this wire has a brown color. 8. Make sure all wires are fully inserted into the mini switch. 9. Turn on the main switch to enable the mains again. 10. Test whether the device works by pressing the button on the switch. (be careful and avoid touching the wires). The LED on the switch will be lit. The connected device will also be turned on. 11. Do not close the junction box yet. 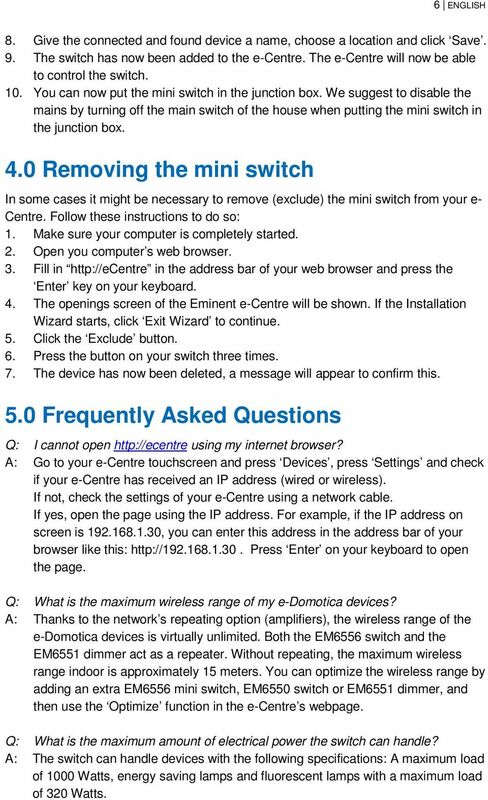 3.2 Assigning the mini switch to the e-domotica e-centre There are two situations possible when assigning the switch to the Eminent e-centre. 1. You assign the switch to the e-domotica e-centre during the installation process of the e-centre itself. 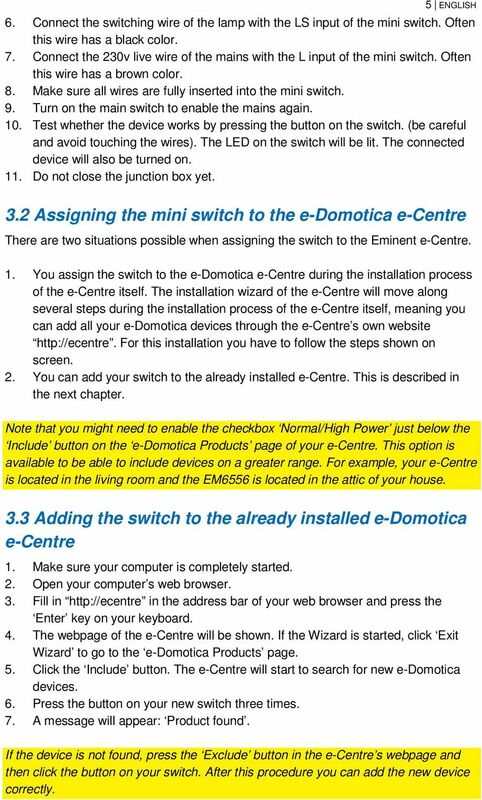 The installation wizard of the e-centre will move along several steps during the installation process of the e-centre itself, meaning you can add all your e-domotica devices through the e-centre s own website For this installation you have to follow the steps shown on screen. 2. You can add your switch to the already installed e-centre. This is described in the next chapter. Note that you might need to enable the checkbox Normal/High Power just below the Include button on the e-domotica Products page of your e-centre. This option is available to be able to include devices on a greater range. For example, your e-centre is located in the living room and the EM6556 is located in the attic of your house. 3.3 Adding the switch to the already installed e-domotica e-centre 1. Make sure your computer is completely started. 2. Open your computer s web browser. 3. Fill in in the address bar of your web browser and press the Enter key on your keyboard. 4. The webpage of the e-centre will be shown. If the Wizard is started, click Exit Wizard to go to the e-domotica Products page. 5. Click the Include button. The e-centre will start to search for new e-domotica devices. 6. Press the button on your new switch three times. 7. A message will appear: Product found. If the device is not found, press the Exclude button in the e-centre s webpage and then click the button on your switch. After this procedure you can add the new device correctly. 6 6 ENGLISH 8. Give the connected and found device a name, choose a location and click Save. 9. The switch has now been added to the e-centre. The e-centre will now be able to control the switch. 10. You can now put the mini switch in the junction box. We suggest to disable the mains by turning off the main switch of the house when putting the mini switch in the junction box. 4.0 Removing the mini switch In some cases it might be necessary to remove (exclude) the mini switch from your e- Centre. Follow these instructions to do so: 1. Make sure your computer is completely started. 2. Open you computer s web browser. 3. Fill in in the address bar of your web browser and press the Enter key on your keyboard. 4. The openings screen of the Eminent e-centre will be shown. If the Installation Wizard starts, click Exit Wizard to continue. 5. Click the Exclude button. 6. Press the button on your switch three times. 7. The device has now been deleted, a message will appear to confirm this. 5.0 Frequently Asked Questions Q: I cannot open using my internet browser? A: Go to your e-centre touchscreen and press Devices, press Settings and check if your e-centre has received an IP address (wired or wireless). If not, check the settings of your e-centre using a network cable. If yes, open the page using the IP address. For example, if the IP address on screen is , you can enter this address in the address bar of your browser like this: Press Enter on your keyboard to open the page. Q: What is the maximum wireless range of my e-domotica devices? A: Thanks to the network s repeating option (amplifiers), the wireless range of the e-domotica devices is virtually unlimited. Both the EM6556 switch and the EM6551 dimmer act as a repeater. Without repeating, the maximum wireless range indoor is approximately 15 meters. 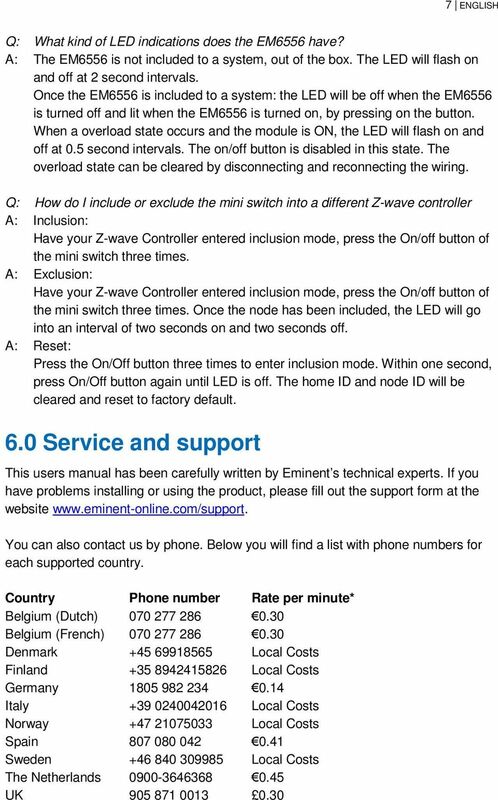 You can optimize the wireless range by adding an extra EM6556 mini switch, EM6550 switch or EM6551 dimmer, and then use the Optimize function in the e-centre s webpage. Q: What is the maximum amount of electrical power the switch can handle? A: The switch can handle devices with the following specifications: A maximum load of 1000 Watts, energy saving lamps and fluorescent lamps with a maximum load of 320 Watts. 8 * Rates mentioned in this table do not include cell phone charges. 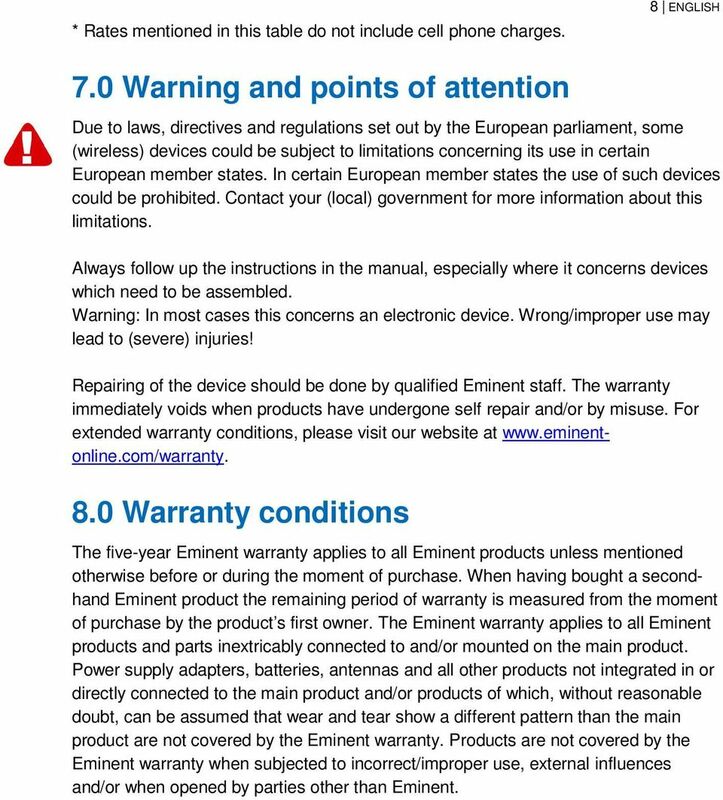 8 ENGLISH 7.0 Warning and points of attention Due to laws, directives and regulations set out by the European parliament, some (wireless) devices could be subject to limitations concerning its use in certain European member states. In certain European member states the use of such devices could be prohibited. Contact your (local) government for more information about this limitations. Always follow up the instructions in the manual, especially where it concerns devices which need to be assembled. Warning: In most cases this concerns an electronic device. Wrong/improper use may lead to (severe) injuries! Repairing of the device should be done by qualified Eminent staff. The warranty immediately voids when products have undergone self repair and/or by misuse. For extended warranty conditions, please visit our website at Warranty conditions The five-year Eminent warranty applies to all Eminent products unless mentioned otherwise before or during the moment of purchase. When having bought a secondhand Eminent product the remaining period of warranty is measured from the moment of purchase by the product s first owner. 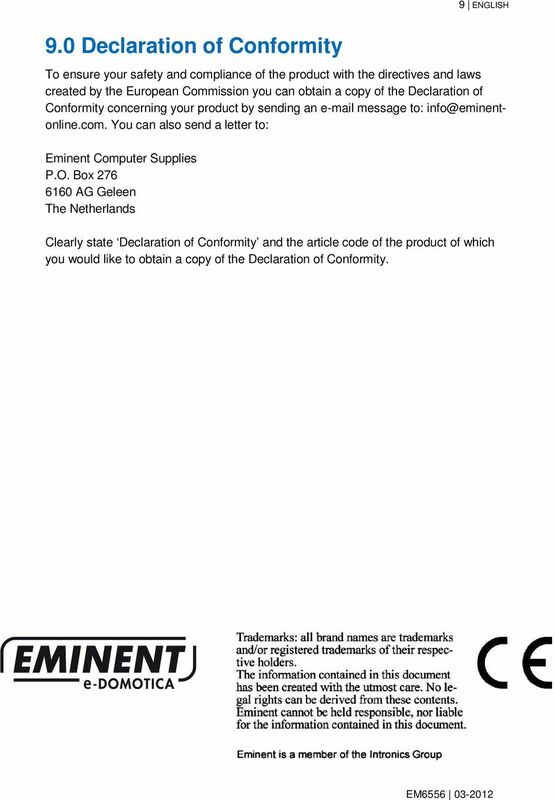 The Eminent warranty applies to all Eminent products and parts inextricably connected to and/or mounted on the main product. Power supply adapters, batteries, antennas and all other products not integrated in or directly connected to the main product and/or products of which, without reasonable doubt, can be assumed that wear and tear show a different pattern than the main product are not covered by the Eminent warranty. Products are not covered by the Eminent warranty when subjected to incorrect/improper use, external influences and/or when opened by parties other than Eminent. ZME_05459 Wall Blind Control Set for Busch-Jaeger DURO 2000 Firmware Version : 1.8 Quick Start A This device is a Z-Wave Actuator. Triple click one of the buttons on the device will include the device. US Installation Manual Smappee Monitor Version 1.3 English, US, version 1.3, revision 23, as of October 23, 2014, 2013 Smappee NV. All rights reserved. Specifications are subject to change without notice. User Guide VERIZON WIRELESS HOME PHONE CONNECT label Welcome to Verizon Wireless Thank you for choosing Verizon Wireless Home Phone Connect. You re now connected to America s most reliable wireless network.